Ryan Strome, center, has two goals and two assists in three games since an eight-game stint in the American Hockey League. SYOSSET, N.Y. — The Islanders have found lineup stability leading into Wednesday’s first game against the first-place but struggling Rangers at Barclays Center. With the return of Ryan Strome and the top line again anchored by John Tavares and Kyle Okposo, the Islanders can focus on their rival with momentum on their side. Strome, 22, has two goals and two assists in three games since his eight-game stint with the Bridgeport Sound Tigers, and the Islanders (13-8-4) have won three of their last four games. The loss came in a shootout on the road against the Panthers on Friday. 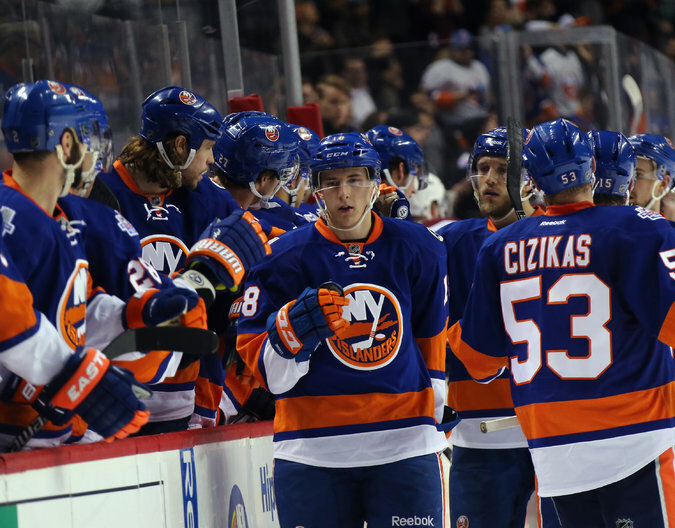 Strome, who had 17 goals and 50 points in his first full N.H.L. season last year, expressed confidence that his brief exile to the American Hockey League would pay dividends.